Every four years, a person is selected to serve as the President of the United States. This is accomplished by a complex selection process determined by the US Constitution and its amendments as well as tradition. for another term as your President." Any citizen meeting these requirements who wishes to run for the Presidency makes an announcement of his candidacy. This public event, in which the news media provides coverage, is filled with excitement and anticipation. The announcement officially kicks off the campaign to receive the nomination of the candidate’s political party. The two major parties are the Democratic Party and the Republic Party. The two major political parties, the Democratic Party and Republican Party, are organizations that work to elect their members to governmental office. When several individuals from a single political party announce their candidacy for the Presidency, only one can represent that party in the general election. To determine which candidate will receive their party’s nomination, a national party convention is held prior to the election. The delegates, or representatives, to this convention are chosen through state caucuses and primary elections. A caucus is a meeting of political party members for the purpose of selecting delegates. A primary is an election for members of a political party for the purpose of nominating candidates. The nominating conventions of the Democratic and Republican parties are held during the summer before the general election. The conventions select their nominees for the President and Vice President of the United States. The pair of nominees are known as their party's "ticket." The conventions also write a platform of positions on the major issues that the party officially accepts. One of the purposes of the conventions is to generate excitement about the nominees. For this reason and since the nomination process is newsworthy, portions of the conventions are broadcast on television and the Internet. With the nominees of both the Democratic and Republican Parties selected, the fall campaign unofficially begins the weekend of Labor Day. A campaign is the organized effort to convince people to support the candidate with donations of money and votes. Campaigns consist of a variety of events including public rallies in which the candidate speaks, interviews on news programs, commercial advertisements on radio and television, and direct mailings to homes. There are television advertisements and mailings to the homes of voters urging them to support a specific candidate. There are rallies in which the candidates make speeches while supporters cheer and hold plaques. 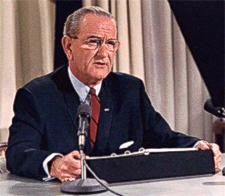 In recent times, the Presidential candidates have debated on national television several times during each campaign and the Vice Presidential candidates debate once. Most of the campaigning is concentrated in those "battleground" or "swing" states where the candidates are closest in the opinion polls. Election Day is determined by law to be the Tuesday following the first Monday of November. For that reason, it always falls between November 2 and November 8, inclusively. 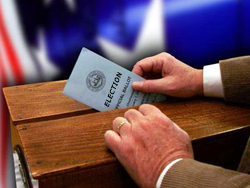 Many states permit early voting or casting a ballot some number of days prior to Election Day. If someone is unable to physically attend an official polling station, an absentee ballot can be cast. When an American citizen casts a ballot in the presidential election, he is not voting for a presidential candidate but for a slate of Presidential Electors. These electors then cast the votes in the Electoral College that determines the next President of the United States. Therefore, Americans select their President by indirect election. Usually the winner of the popular vote is also the candidate who receives most of the electoral votes, but this has not always been the case. 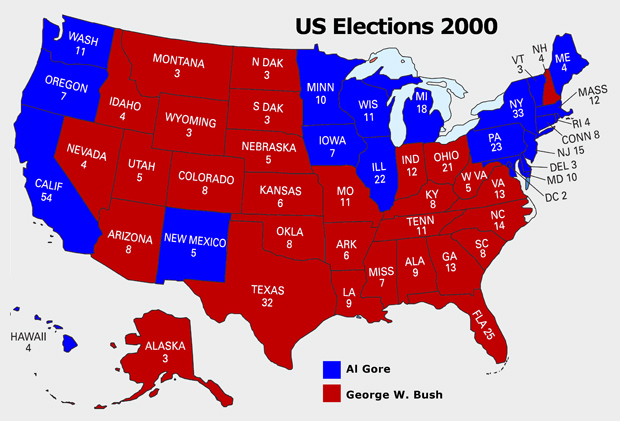 Four Presidents failed to receive the majority of popular votes in their elections: John Quincy Adams (1824), Rutherford Hayes (1876), Benjamin Harrison (1888), and George W. Bush (2000). Although Election Day is a legal holiday in several states including New York, it is not a national holiday. The Electoral College is the group of 538 Presidential Electors who elect the President and Vice President of the United States. When citizens vote for Presidential and Vice Presidential candidates on Election Day, they are actually choosing Presidential Electors from their state. Later, these electors cast the official ballots that fill these two governmental offices. Each state receives a number of electors equal to the total of the number of US Representatives and US Senators (two for each state) in the US Congress. The District of Columbia, which has neither Representatives nor Senators, has three electoral votes. The Presidential Electors meet in their state capitol buildings, or the District of Columbia, on the first Monday after the second Wednesday in December to cast separate ballots for President and then Vice President. These 51 separate meetings collectively make up the Electoral College. The Presidential Electors do not meet as a single organization. On the following January 6th, the electoral votes are counted in a joint session of the US Congress. The candidate for each office who receives 270 or more electoral votes is declared the winner and receives the title of President-elect and Vice President-elect, respectively. thus becoming President of the United States. Although this process of electing the president is determined by the United States Constitution, this document does not actually use the term "Electoral College." The President’s four year term of office begins at noon on Inauguration Day, the 20th of January following the election. To mark the occasion, there is a ceremony called the presidential inauguration. Traditionally, Presidents have concluded the oath by adding the words "So help me God." The oath is usually administered by the Chief Justice of the Supreme Court on the steps of the US Capitol although another federal judge or a state judge could do so. Although not required, many incoming Presidents have sworn the oath while raising their right hand and placing their left upon a Bible. Following the oath, bands play Hail to the Chief, the official anthem of the President of the United States, and the President receives a 21-gun salute. The President then delivers an inaugural address, a speech that provides a direction for the new administration. 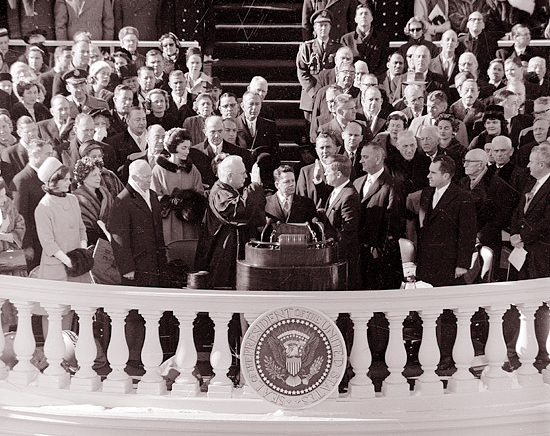 The Vice President-elect is sworn into office during this same ceremony. The remainder of the day and evening consists of inaugural celebrations including a parade, banquet and several formal balls or parties. And so, the new President's term of office begins. The US Election polltracker provided updated statistics from several polling services for the major party candidates throughout the presidential campaign. With 270 Electoral Votes required to win the presidency, the 2016 electoral map looks like this! During the summer, the Democratic National Convention and the Republican National Convention each select their nominees for the office of President and Vice President. For additional information on this campaign, visit Presidential Election of 2016.